[IAEP] [UKids] RE: How To Reinstall XO Tablet Software? Previous message: [IAEP] How To Reinstall XO Tablet Software? > (who will be 4 in a month) can remember and enter by herself. > XO may look for it there. No, certainly not. Nobody would look at the OLPC OS releases page. It would be as likely as air conditioning on a motorcycle! 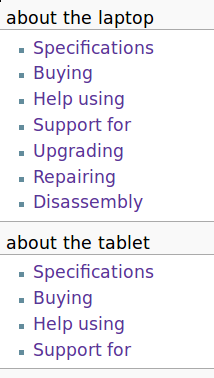 where it says "about the tablet" and "support for". See attached fragment of screen.